Models are useful. They help us understand the world around us and aid us in predicting what will happen next. But it’s important to remember that models don’t necessarily reflect the underlying reality of the thing we’re modeling. The Ptolemaic model of the solar system assumed the Earth was the center of everything but in spite of that spectacular error, it did a good job of predicting the motions of the stars, planets, moon, and sun. It was the best model available for over a thousand years. But new data (e.g., phases of Venus as revealed by Galileo’s telescope) and errors in predicting the motions of the planets demonstrated that the sun-centric Copernican/Kepler models were superior. Another VIX behavior that departs from a simple mean-reverting process is the abrupt cessation of values below 9—almost a wall. For a normal mean reverting process you would not expect such a sharp cut off at the low end. The Acid Test: How good is the model for predicting the future? Having a good model for a process is useful because it can help us predict at least some aspects of the future. For example, we can use our average gas mileage to decide whether we need to gas up before entering a long stretch of highway without gas stations. A simple mean-reverting model is not particularly good at predicting the future moves of the VIX. If the VIX is low (e.g., 12 or below) a simple mean-reverting model predicts that since the VIX is far from its mean that will likely increase soon. But history shows this is usually not the case. Often the VIX can be quite content to hang around 12. This leads to news stories quoting various pundits stating “The VIX is broken” –when in reality they are just using an inferior model. As I said earlier there are VIX models out there that address some of these deficiencies. Unfortunately, the ones I know of are complex and not very intuitive. I believe the model that I describe below can improve our intuition considerably without adding too much complexity. A better way to view the VIX is that it behaves like the combination of two interacting processes: a specialized mean reverting process and a “jump” process. The jump process captures the behavior that all VIX watchers know—its propensity to occasionally have large percentage moves up and down. Since 1990 there’ve been over 86 times where the VIX has increased 30% or more in a 10 day period. The occurrence of these spikes is effectively random with a probability of happening on any given day of around 1.28%. It’s like a roulette table with 78 slots, 77 of them black and one red. If the ball lands on a black the normal reigns—if red then things get crazy. The graph below shows a histogram of the number of days between these 30% spikes in the VIX since 1990. There’s nothing that prevents reds on consecutive spins nor is there some rule that reds become really likely if you haven’t had a red in a while. The roulette ball has no memory of where it landed on previous spins. VIX jumps are generally not just one-day events; subjectively it looks like it takes around two weeks before the market reverts to more typical behavior. 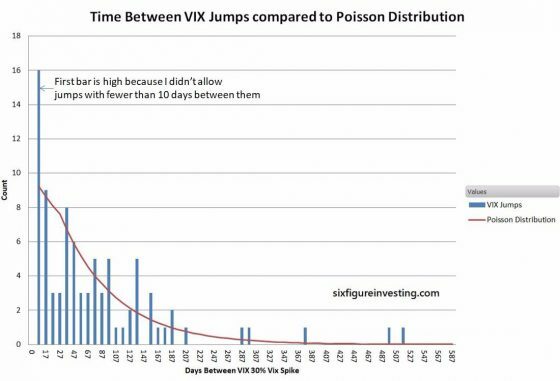 The model assumes that when a jump occurs it essentially drives the behavior of the VIX for 10 trading days. 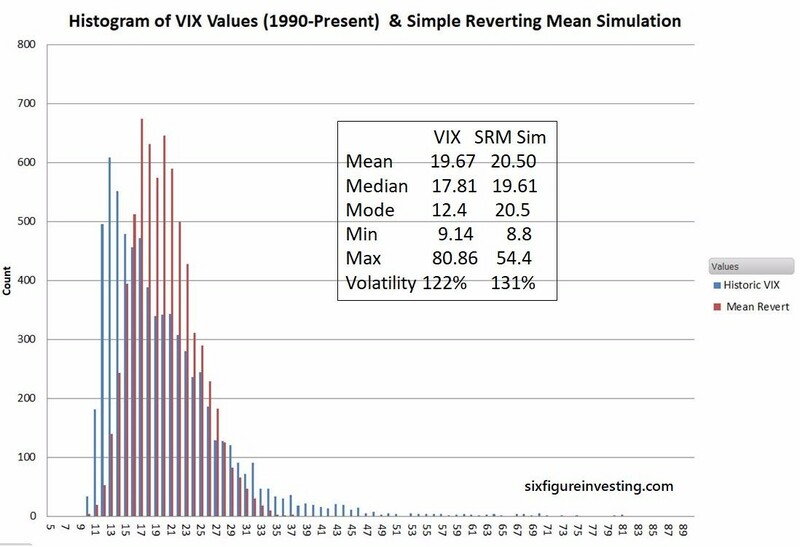 The other process, the specialized mean reverting process, addresses the non-jump mode of the VIX—which is historically around 85% of the time. 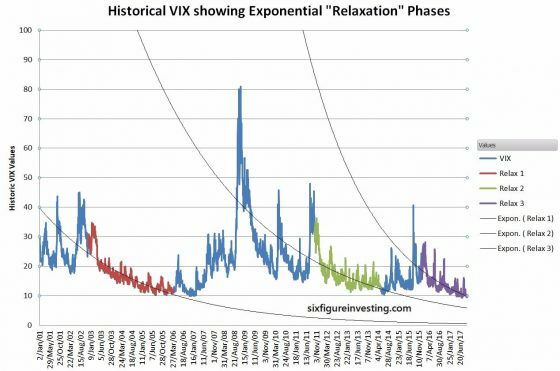 One of the key behaviors it needs to address is the slow relaxation in the mean value of the VIX after a big volatility spike rekindles a generally fearful attitude in the market. This decay process continues (unless interrupted by another VIX jump) until the average monthly VIX values drop into the 11-12 range. The chart below illustrates this relaxation process. 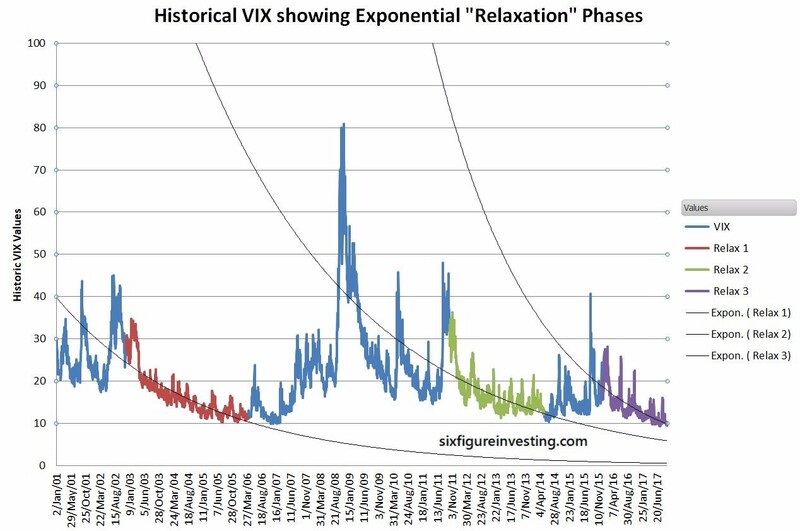 This characteristic can be modeled by expecting the short term mean of the VIX (when it’s not jumping) to decay exponentially until it reaches its “quiet” mean of around 11.75. It works well to quantify this decay as having a time constant of 150 days. 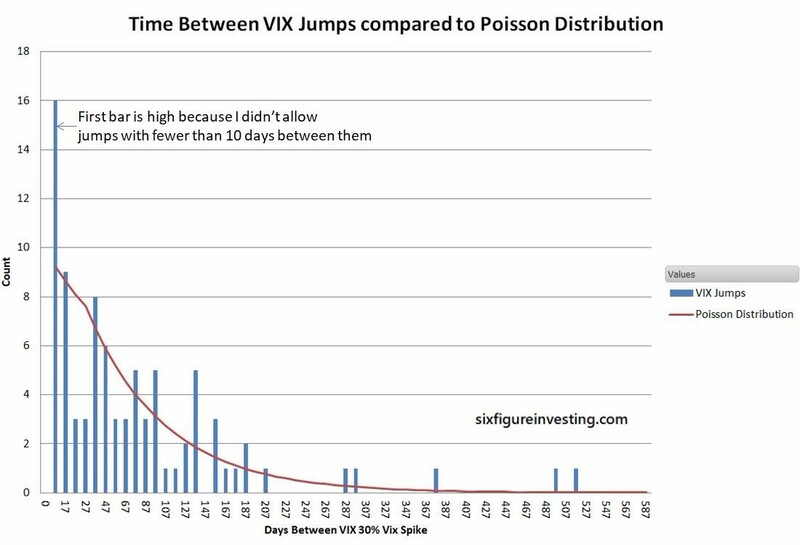 With this approach, sans jumps, the difference between the current VIX value and its long-term quiet value will decay by 50% in 104 days. 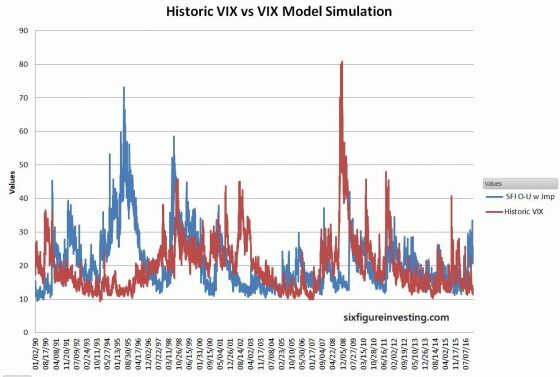 So if the VIX is at 30 the model predicts the mean will decline to 20.75 in 104 days [30- (30-11.5)*0.5=20.75]. If there are no jumps for the next 104 days the VIX’s mean would decline to 16.13. If a jump occurs in the interim the short term mean is reset to the VIX’s value at the end of the jump. The other part of the specialized mean reverting process mimics the day-to-day volatility of the VIX. I used a formal mean reverting diffusion process (Ornstein-Uhlenbeck) to accomplish this. Despite its scary name, you can think of it as a random walk with the thing “walking” being attached to the mean with a spring—similar to walking a dog with a springy leash. The further the dog gets from you the larger the force pulling the dog back to you. Unlike the simple mean-reverting model often used for the VIX, this process has a much tighter distribution, with the extreme values effectively limited to around +-20% from the mean. When the VIX is quiet this process replicates the firm lower limit on the VIX, a VIX of 9 is -21.74% lower than a quiet mean of 11.75. 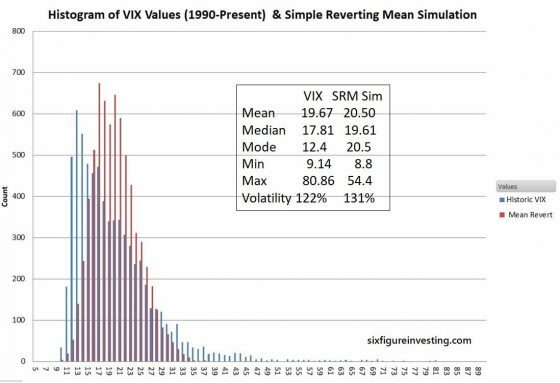 To implement/validate this model I estimated the key input variables and then used Excel to simulate 20-year volatility sequences. I then compared these time series to the actual VIX history and tuned the model’s parameters such that the key characteristics (e.g., volatility, mean, mode, decay rates) were similar to the VIX’s historic values. The next chart shows an example 20 year time series of the simulated VIX combined process compared to the historic VIX. The two series aren’t time synchronized; my intent is to show how the simulated VIX time series has the same visual feel as the real VIX. This improved model is not a path to riches. It isn’t any better than other models at predicting when VIX jumps will occur. 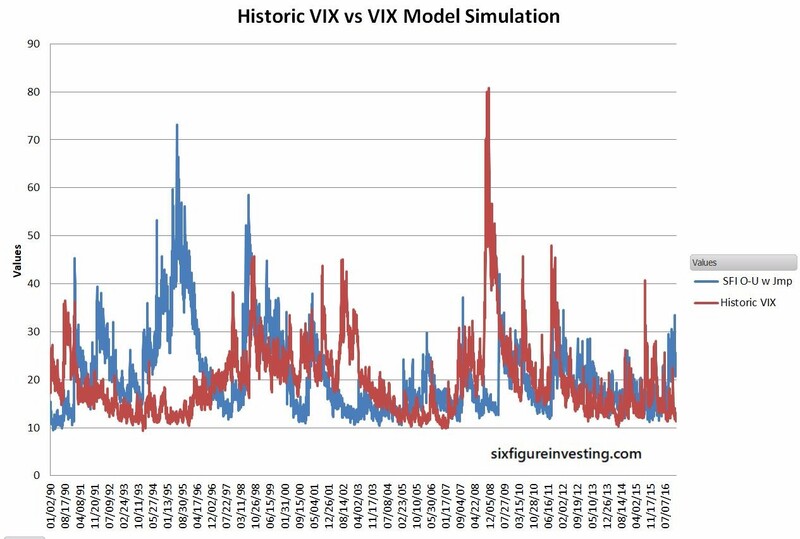 However, this model does help us understand how the VIX behaves over longer time spans. In particular, during times of sustained low volatility, it predicts that the VIX will tend to stay low until the next significant VIX spike and not trend up like the simple mean-reverting model demands. The Jump process used (with a few small tweaks) is a compound Poisson process where the probability of a jump sequence is random with a probability of a jump being 1.28% per day. The jump sequence and its daily amplitudes are determined using a technique borrowed from rappers called sampling. 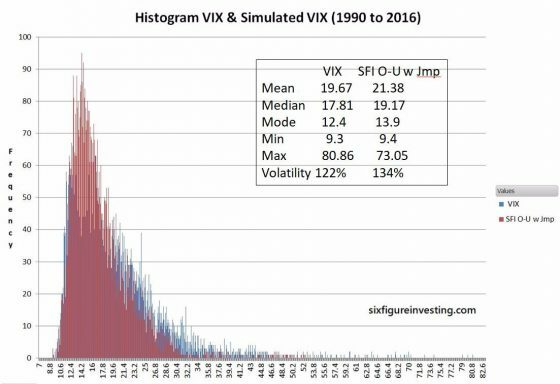 Instead of trying to recreate the decidedly non-Gaussian distribution of VIX jumps I reused historic VIX jumps by randomly selecting, and replaying one of the more than 85 jump sequences since 1990 where the VIX jumped more than 30% in 10 days. Each jump sequence is 10 days long, with the first 2 days being the behavior before the jump.